It's really difficult to succinctly describe this game, so take a look at the pictures! 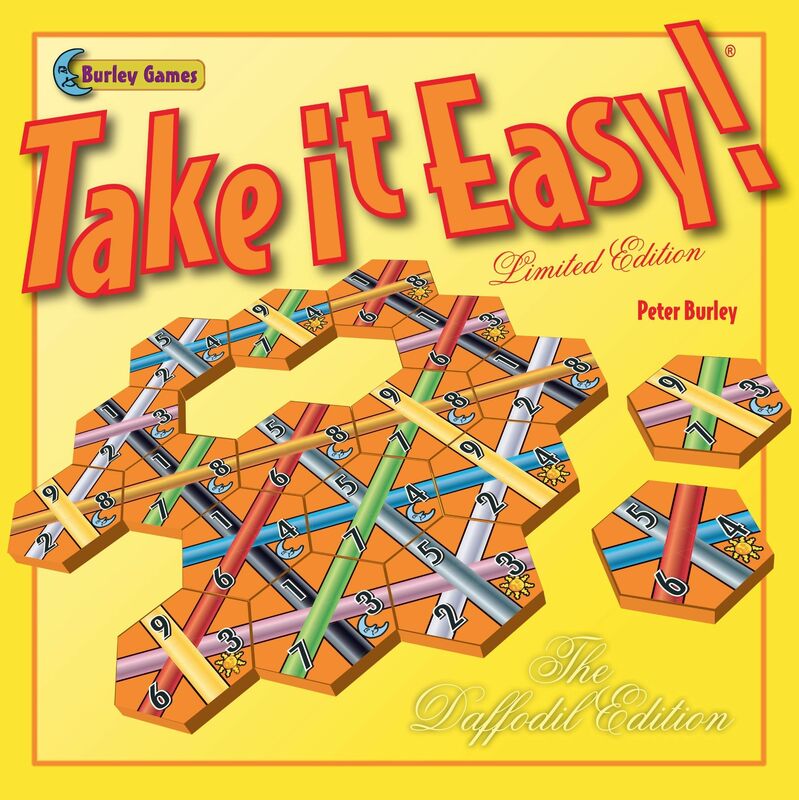 Take It Easy is a true multi-player solitaire in which each player individually completes a hexagon-shaped board with spots for 19 hexagon tiles. There's no limit to number of players if you've got enough sets on hand. One person (the caller) draws a tile randomly and tells the others which of the 27 tiles featuring colored/numbered lines crossing in three directions, with numbers from 1 to 9, it is. "The 9-8-7," for example. Each player then chooses which empty spot on his own board he'll play the 9-8-7. This is repeated until the boards are filled. The idea is to complete same-numbered lines across your board. Scoring is calculated by multiplying the number on the tile with the number of tiles in the completed line. A complete column of three 9s is worth 27, for example...but a lot of players will hope for five 9s to fill the big column down the middle. Take It Easy is often compared to Bingo because of the familiar pattern of a number being called and then everybody looking at their cards to play it, and then scoring if a line is completed. But that's as far as the comparison goes. Bingo is sheer luck; Take It Easy is a game of skill.